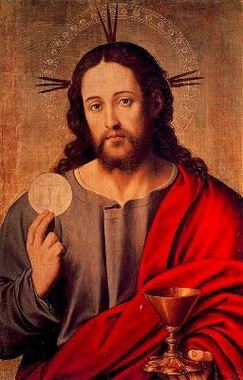 The adorable mystery of the Eucharist sums up, contains, and communicates to us the entire mystery of Christ: His incarnation, life, passion, death, resurrection, and ascension, and outpouring of the Holy Spirit. If you seek the open Side of the glorious ascended Christ, you will find it in the Eucharist. If you seek the pierced Heart of Christ, beating with love for the Father and with mercy for sinners, you will find it in the Eucharist. The Communion Antiphon of the Mass of the feast is meant to be repeated and treasured. It is, at once, a promise and an invitation: "Behold I am with you all days, even to the consummation of the world" (Mt 28:20). Here, apart from the Epistle, Gradual, Alleluia, and Gospel, is my own translation of the Proper of the Mass of the Eucharistic Heart of Jesus, together with (optional) General Intercessions. which You have hidden away for them that fear You, alleluia (Ps 30:30). make them burn with the flame of Your divine charity. the mystery of the Eucharist. and they receive the pledge of future glory. even to the consummation of the world (Mt 28:20). in finem crescere mereamur. Qui vivis. and to grow therein unto the end.